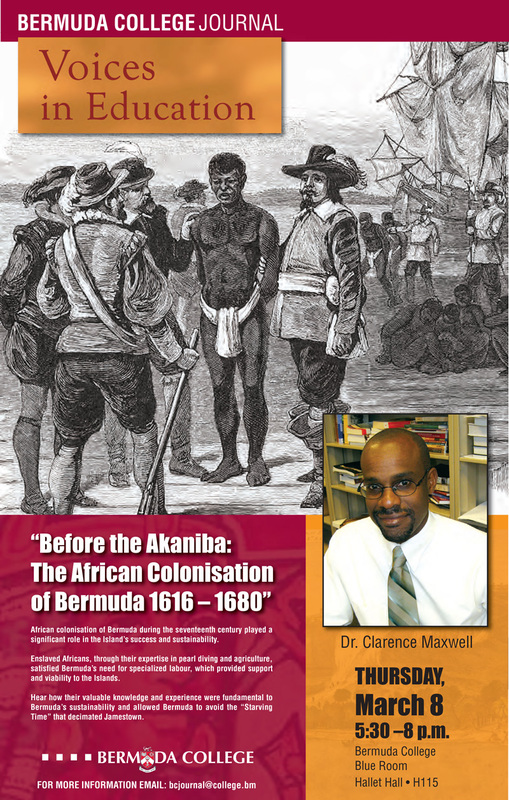 The event poster said, “African colonisation of Bermuda during the seventeenth century played a significant role in the island’s success and sustainability. “Enslaved Africans satisfied the need for specialised labour such as pearl diving and agriculture, staving off starvation and, through that expertise, provided both sustainability to the islands. The event will be presented by the BC Journal: Voices in Education Committee. Dr. Maxwell is an internationally recognised scholar of the Atlantic World, this should be a sell out event …. Warlord2 please feel free to yawn in the privacy of your own home. Why the yawn? If the subject matter bores you, why not just move on to a topic that interests you? Onion Juice “doneenworrywiffit” you are not going to get a cent, might have to get off your backside and earn it for a change. You’re only a slave if you’re too stupid to stand up for yourself. I’ll take my reparations before you do, at least I earned mine. And the fact that most European countries plundered and raped Africa of its resources, minerals and wealth ( not to mention its people who gave their lives to work for FREE while Europeans built their empires and generational wealth) and creating a system that disenfranchised African descendants, murdered, incarcerated and exiled vocal Black Leaders to silience them. We’ve been off our backsides all our lives while you undeserved privileged gloat in your shady inheritence that is protected by a Historical Racist System. The Sh1t you talk. Not all white people are independantly wealthy descendants of plantation owners. You live in a cartoon world. All you ever want is handouts. And here we are with the “head start” again. Tough mate. Get used to it. U realise those that got the “head start” are few and far between right. So as terry said, nope. Work like the reat of us. All u do is waste time that could be spent earning by comstantly beating the reparations drum. As always, Onion Juice shows that he doesnt want equality and fairness. He wants to be the one doing the oppressing. The one with the unearned privilege. He’s just as bad as the people he rails against. Good to see you’re on the mend! I get my bike back? Won’t be able to attend. Would be nice if the presentation could be recorded by video or audio. It really makes you think why they don’t teach this in the schools but we have to learn everyone else’s history or the lie that our history starts with slavery. I always wondered what the slaves in Bermuda were doing in those days. You can’t say they picked cotton. So what was their true purpose and what did they do while they where kidnapped and brought over here to work for free? Dr. Maxwell is an internationally recognised scholar of the Atlantic world, this should be a sell out vent. Warlord2, feel free to yawn away at home. Tania, sit down honey…no one cares about his false credentials. It’s odd that there is such a glaring error in the title of his presentation, given that he’s a ‘recognised scholar’. Sounds good – wish I could attend! Hey Bernews is there an associated book or audio by Dr. Maxwell? Just for the record African slaves made no impact to the pearl diving or feeding of Jamestown. Firstly the slaves bought to dive pearls were Arawaks from the Carribean not Africans also there were no pearls to be found in Bermuda. As for feeding Jamestown history suggest that the boat that returned from Jamestown with Sir George Somers who died during that trip did not carry slaves and very little was said after to my knowledge. Bermuda was flush with cahows turtles and wild boar which would likely have been the bulk of any food stocks that would have been sent to Jamestown. So given the timeline how exactly did African slaves play any part in this period of history? A perfect question (assuming it was not rhetorical, what a shame that would be), I would suggest you attend the lecture and find out! No doubt Professor Maxwell can provide you with the insight you seek.